A 20-day old baby who was buried alive by her parents who suspected her of being possessed has been rescued by a passer-by. 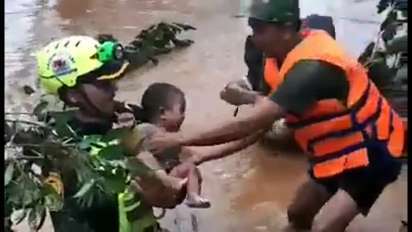 The baby was reportedly underground for about three hours before she was discovered by the passer-by who heard the baby’s cries. Upon discovery, locals in the area dug her out and rushed her to a government hospital where her condition has been reported stable. The incident happened in Shahjahanpur, northern India according to reports by Mirror. “I was passing through the area at half past seven when I heard a baby crying. “The sound of her cries led me to the spot. I quickly dug up the earth and found her alive. “I quickly took her to the nearby government hospital and later informed the police. “It is such a cruel act. “I cannot believe how a person could abandon the baby in this cold weather,” passer-by Dharmendra Kumar, who first heard the baby’s cries said. Parents of the baby, a 30-year-old man and 28-year-old woman, according to police reports, buried their third-born child with the help of two relatives. It was gathered their action was based on the instructions of a witch doctor who claimed the infant was possessed. Police added that the baby’s father, aunt, uncle and the witch doctor, have all been arrested. Subhash Chandra Shakya, Additional Superintendent of Police (Rural) said: “The baby was buried alive by her maternal aunt Aasma after she was asked to do so by the parents of the baby. “This step was taken on the advice of a Tantrik who had claimed that the baby girl was possessed and her presence at home could destroy their life.